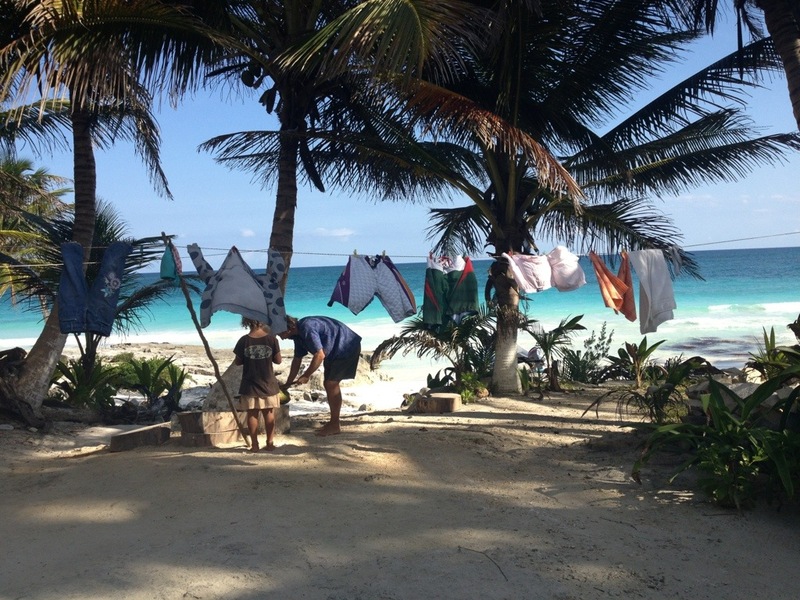 I woke up, took off my lovely fuchsia eye-mask and saw out of the window a white sign saying “Tulum” – a good relief after about 15 hours bus journey. I did not have any idea where to go nor where to stay. Actually, I didn’t even know much about this place but the fact that it had stunning Maya ruins, beautiful white sands and turquoise waters. At the taxi queue there were 4 people I had seen on my bus from Chiapas, they also seemed not to know where to go, they wanted me to go with them in the taxi, but the driver seemed not to agree in carrying 5 people + backpacks so I gave them a warm smile and thank them anyway; That is one of those sliding doors situations. The people you meet will obviously change the rest of the trip. I imagined to have hopped on that taxi with those strangers, but I realized to be more happy to have stayed. No taxi around, so I decided to go for a nice breakfast first. It was 830 am, there was no rush. I ordered a fresh orange juice and a coffee. I wrote Elisabeth on whatsapp, she suggested me a place called La Cigana, 400 metres from the bus station and Just after the last juice sip I walked still a little bit lost and sleepy, to find this place.. I knocked few times at the hostel door until a nice Australian guy opened me, I thought he was working there but I found out he was just a guest. It was good news to hear from the staff that there was availability for me. I left my backpack in the room, put my belongings in the safe and joined few other people that were having breakfast outside. Among them, a pretty girl from the Italian Switzerland. She had just arrived to Mexico and was heading to Costa Rica, where she would work in a community as the previous year. She had a mysterious and a fragile look, but she was sweet and I even funny. Nathan, the guy who had opened me the door was there with his travel mate Steven: two students from Melbourne travelling South America with Rio de janeiro as final destination, as me; then, a lovely couple from New Zealand, Julie and Ben were having a coffee and talking about their next stop Belize. Me, Martina, Nathan and Steven decided to go and rent a bike and go to a cenote. We all rent a playera bike, stopped at a fruit dealer (delicious fruit) and headed to the Big Cenote. I was not familiar with this word neither. I loved biking, enjoyed and felt a baby scampering for those wide long roads feeling the air and sun on my face. We even improvised a race to see who was the fastest, I won one. We finally arrived to destination: I had never seen something similar, we rented the snorkelling equipment and swam into that quite big Cenote, a kind of large open water pool; technically it is a type of sinkhole that contains water coming from the rain that infiltrates through the ground. When driving from a town to another in Quintana roo and Yucatan, you will see many of them; they are very popular in this area. 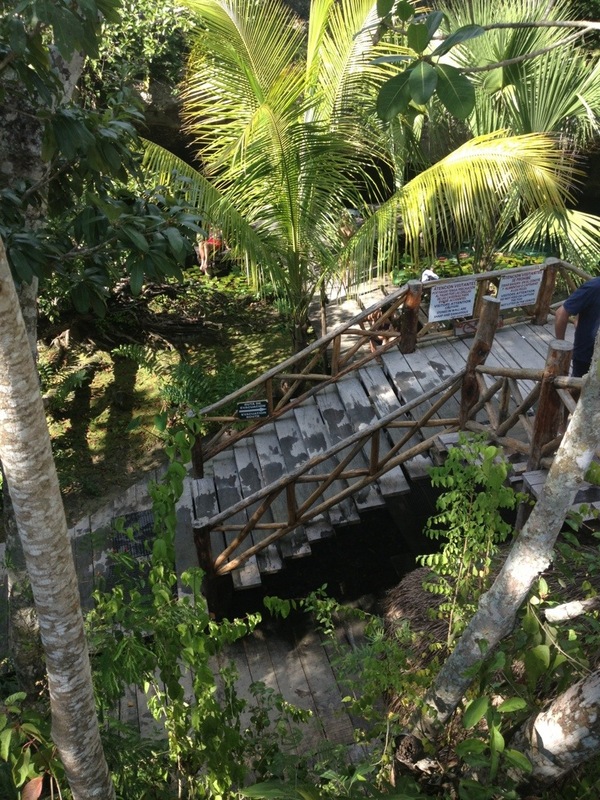 At the cenote we saw many turtles and fishes, it seems to be suspended in the air while you re down there. We all enjoyed it, including my little doll Dora, who took her first season swim among frogs, turtles and huge leaves floating in the water. There were also many iguanas, one of which was huge and laying undisturbed on a branch observing the divers and the swimmers in the cenote. 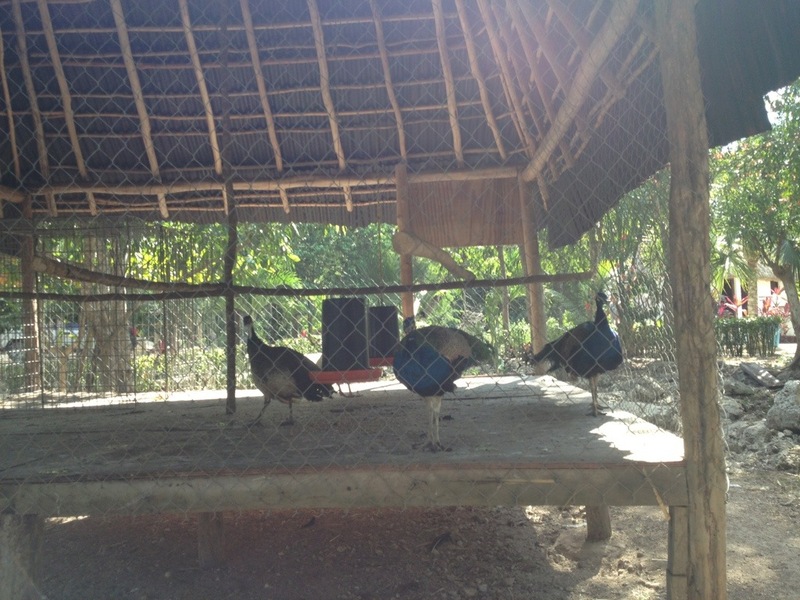 The only thing I really didn’t like was seeing beautiful colored peacocks pent up in a cage, it was horrible to see them there while the rest of his similar were enjoying their freedom in a wild context. 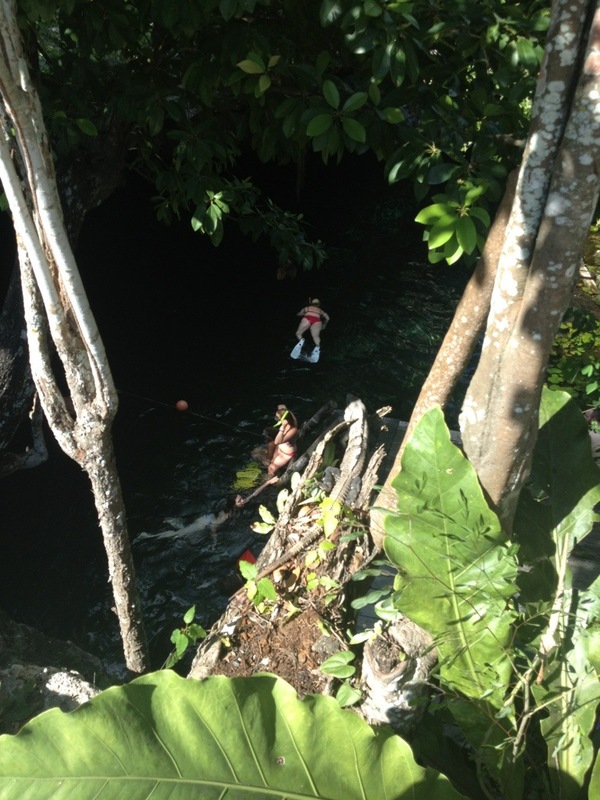 We left the cenote with a great desire of jumping in salt Caribbean waters. Biking through the coast we decided that the four of us would rather move to the beachside rather than staying at La Cigana in the town. We had a swim and the guys went back to the town while me and Martina enjoyed a delicious fresh fruit juice at Mezzanine lounge bar.
. Then we all gathered at la cigana after dinner. 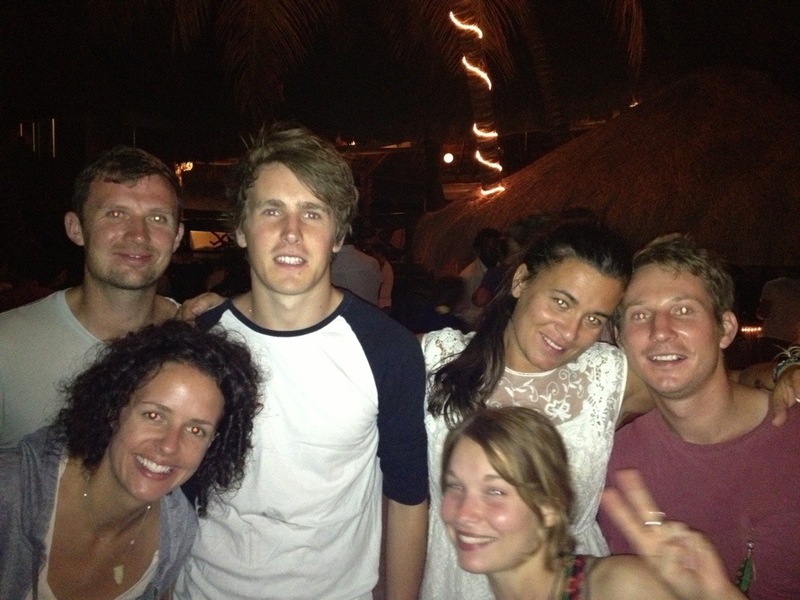 Our Saturday night fever in Tulum ended up with tequilas for all of us, and while getting to a cab that would get us to the beach we sang ” one day baby we ll be old” from Asaf Avidan. 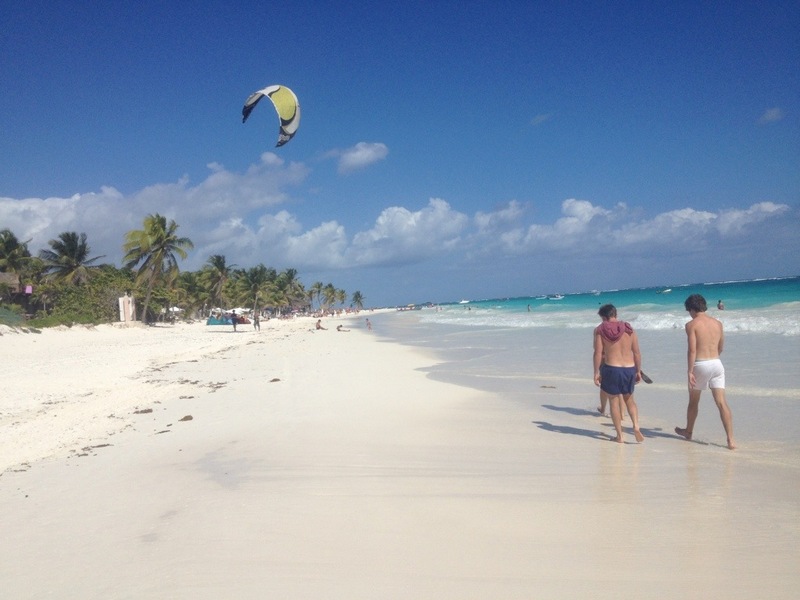 When I found myself on soft and white sand while listening to cool electronic music I woke up again from the amazing dream I am living; tequilas might help but I just believed once again that Mexico makes me happy. There must be a special energy in this country! 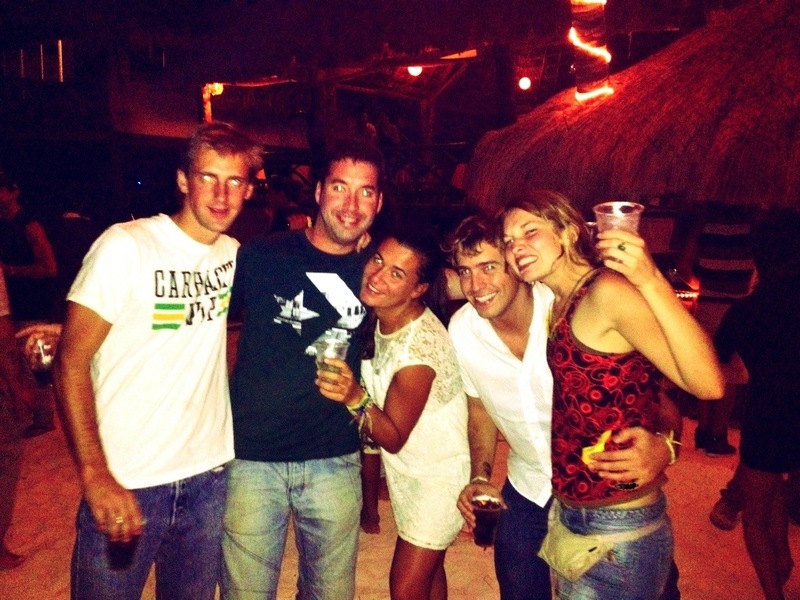 We danced all night long and met few Spanish guys living in D.F. Mosquitos were quite a pain, but it was still a magical night, we even saw a shooting star and I nearly fell asleep in a beautiful paradise bay. My travel friends had gone back to the hostel. Hotel Diamante was a paradisiac spot, but not worth to remember or recommend. That morning we decided to go to a 40 minutes colectivo to Akumal, a town halfway to playa del Carmen considered one of the most important turtle-spotting place. 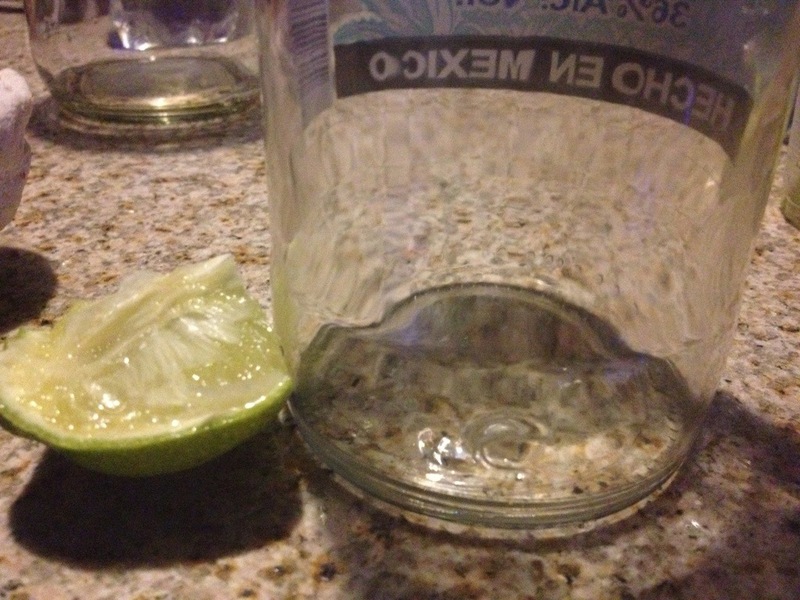 We were all with a “cruda” – hangover in Mexican Spanish. So I could not really enjoy that day as I might have wanted, but lying on the sand listening to Martina life stories while Steven was dealing with about 8 giant turtles was nice. Once back in town we looked for a tacos place and had tequila shots on our hotel beach. Singing, talking and making time trying to be a good company for the kiwi couple who had to leave to Belize during that night. Our effort lasted until just midnight, when we kissed them goodbye and wished them safe travels. If sleeping without windows was incredibly fantastic, hearing cucarachas under the bed was definitely frustrating; I am glad I was with a lovely company of three, most of them so friendly with cockroaches. They were even upset for having to disturb them and taking them out. I really envy the kind of people who deals with any kind of animal and don’t get nervous when meet one of them. Maybe it is because I always lived in a city and never really had the opportunity to become tolerant towards them. I always thought that this would be a great limit for me when having to travel, but I am sure that with this trip I improved a lot is aspect. And I am more than keen to get it better. Boundaries are always good to overtake, even if sometimes it takes time. Willpower helps, if you have any, and it is a good point of start. The morning after we woke up quite disturbed for the humidity, noises and general uncomforting feeling, but we had a nice breakfast on the rocks with nutella and bread and then walked all the way to the Tulum ruins. 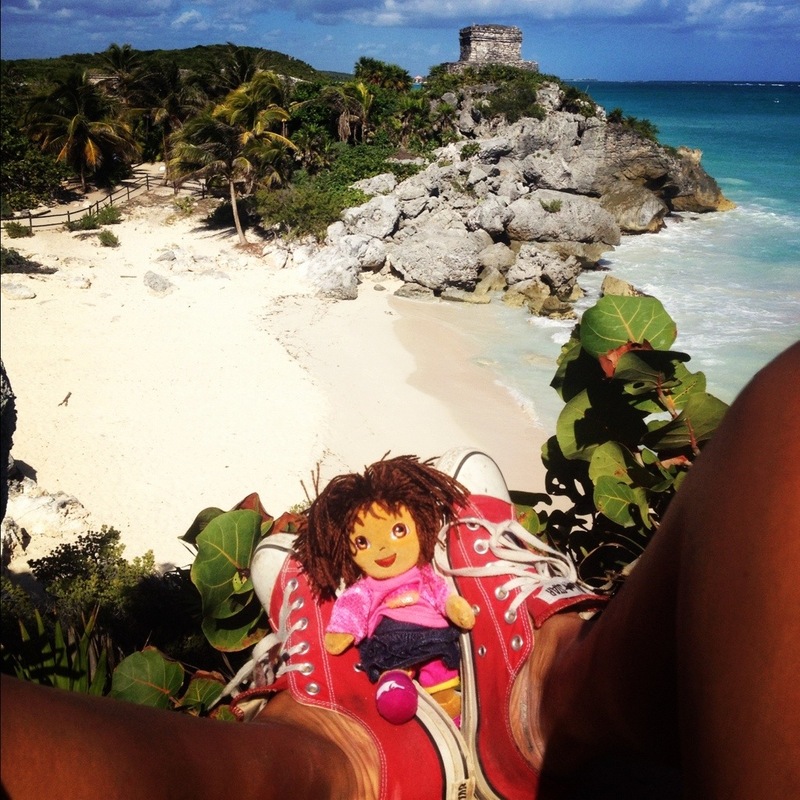 They are situated on quite tall cliffs and it is one of the best-preserved coastal Maya sites. There is a big castle and several other buildings: those ruins are quite small but they are the only ones overlooking an unbelievable turquoise sea, one of those images you will keep in your eyes forever. A postcard. We probably bumped into more than 30 iguanas during our visit of the ruins, hidden and camufled among the precious rocks. I like them a lot, and remind me a lot of Maldives, where is very populated by them. We enjoyed our last stop at the delicious ice cream shop “Panna e cioccolato” before to say them goodbye. 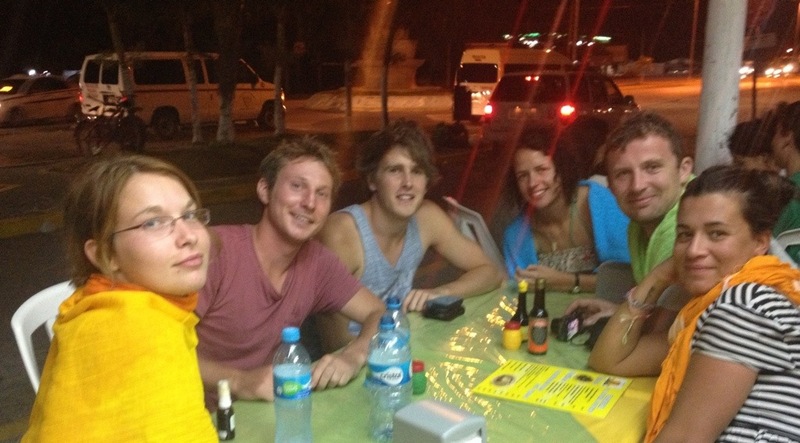 Nathan, Steven and Marting were heading to Merida but I needed to keep my way on my own and headed to playa del Carmen. I stopped with my right hand a crazy collectivo driver while holding the backpack with the other hand. While placing the backpack on the little bus I couldn’t stop observing those three smiling and enjoying guys who made my last few days trip more pleasant. The driver said: “rapidito senorita”. Time to leave. Again on my own, always the same feeling. Nostalgic for the goodbyes but with the adrenaline of starting a new adventure. ← Silver, posters and paintings in D.F.